Worlds in a Paper Binding: Procrastination! Are you ready? If so, let's go. 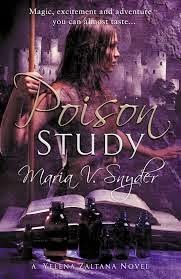 This week I started reading Poison Study by Maria V. Synder. So far I am loving it. It's just the kind of fantasy world that I love to pick up and live in for a while it just seems like such a full world if that makes any sense. that I look at them I think 'I'll leave them for another time.' I do this all the time. Why do I do it? Sometimes I feel like I'll appreciate a book better at another time or that I'm just not in the mood for that book now. But as I read Poison Study I know that this is a book that I would have loved no matter when I picked it up. I think I'm going to make it a goal to read more books that have been on my shelves for the longest. Wait, what? This is completely out of the blue but I think I'll make a goal to read three more of the books that have been on my shelves for the longest before the end of the year. Three. Yeah, I can do three. I'm going to try and live in the book-moment and just pick up whatever I want when I want to read it. No procrastination. Because it is unfortunate when a series that I know I'll love gets put off. After a while they begin to lose their appeal. Which is such a shame. I find myself feeling regretful in a bookshop because I won't get the chance to read a new book for a long time. Well not for long. I'm working through that TBR pile one book at a time. That's all I think. Three of my oldest unread books by New Years. A new goal. They're always fun.